Tuesday was International Plastic Bag Free Day and that got us thinking. Every time we visit the shops, we pop our groceries into a plastic bag and cart them to the car, then from the car to the house. But, you see, the life cycle of the humble plastic bags is actually a whole lot longer. Plastic bags are made from crude oil, which is heated to form Polyethylene which is moulded into a string of soft plastic. This string is then stretched, cut and dyed to form what we know as a plastic bag. Plastic bags account for 0.2% of the world’s oil consumption. To put this in perspective, America, alone, requires 12 million barrels of oil per year just to make plastic bags. This doesn’t include the fuels used by the ships, trucks and vans in which the plastic bags travel to get to your local shop. 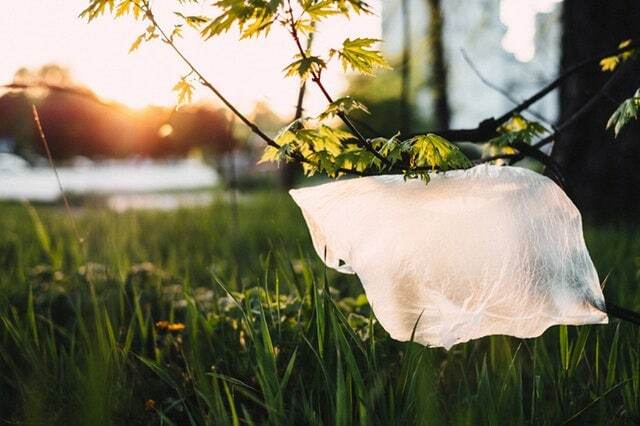 Plastic bags are used for an average of 20 minutes before they are discarded. Only 1% of the 250 -500 bags used per consumer per year are recycled, the other 99% end up in landfills, caught in trees or find their way into rivers and oceans, where they are mistaken for food by animals. Plastic Bags that are recycled require 85 times more energy than it takes to create a new bag. Those which find their way into landfills will be buried and last up to 1000 year before they degrade into nothing. Plastic Bags which end up in the oceans are broken down and consumed by birds and ocean creatures. Fish which are trawled for human consumption, often have small plastic particles inside of them. When plastic degrades, it releases to toxins which damage the environment. These toxins are responsible for the deaths of millions of birds and over 100, 000 animals including dolphins and whales each year. All single-use plastics have a similar life cycle. In order to make a difference, we encourage you to cut as much single-use plastic from your life as possible. Plastic bags can be replaced with reusable hessian bags, bottles can be replaced with metallic or glass bottles which can be refilled. If you would like to reduce your plastic waste, don’t hesitate to give us a call on 0845 500 4455 or send us an email to contact@drinkingwaterfountains.co.uk. Let’s make a difference, together.